"An authorization to use military force, a declaration of war, or any similar authority shall not authorize the detention without charge or trial of a citizen or lawful permanent resident of the United States apprehended in the United States, unless an Act of Congress expressly authorizes such detention." Unfortunately, the Senate also passed the Ayotte Amendment preventing the use of funds to transfer or release detainees from Guantanamo to the U.S. The vote was 51 to 44 in favor of the ban. Senators Dianne Feinstein (D-Calif.) and Mike Lee (R-Utah) today introduced an Amendment to the NDAA that would ban indefinite detention of U.S. citizens. The language of the amendment assures that no authorization to use military force, war declaration or any similar authority would allow an American apprehended in the United States to be held without charge or trial. The 668 page NDAA bill for 2013 is S. 3254, available here. Last week I wrote about Manhattan federal court Judge Katherine Forrest's granting of a permanent injunction against the indefinite detention provision of the National Defense Authorization Act. Her 112 page opinion is here. The feds sought a stay pending appeal from Judge Forrest but she denied it. 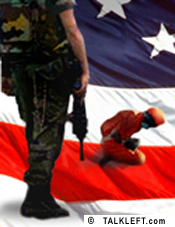 U.S. District Court Judge Katherine Forrest (SDNY) has granted a permanent injunction against the provision in the 2011 National Defense Authorization Act that allows the indefinite detention of individuals (including U.S. citizens) who substantially support Al-Qaeda, the Taliban or their “associated forces." The 112 page ruling is here. This Court rejects the Government’s suggestion that American citizens can be placed in military detention indefinitely, for acts they could not predict might subject them to detention, and have as their sole remedy a habeas petition adjudicated by a single decision-maker (a judge versus a jury), by a “preponderance of the evidence” standard. That scenario dispenses with a number of guaranteed rights. President Obama today signed into the National Defense Authorization Act, which contains the controversial and objectionable provisions on indefinite detention and restrictions on transfers of detainees from Guantanamo. He issued a signing statement with it that doesn't ameliorate the damage. While President Obama issued a signing statement saying he had “serious reservations” about the provisions, the statement only applies to how his administration would use the authorities granted by the NDAA, and would not affect how the law is interpreted by subsequent administrations. Truthout reports the White House is drafting an Executive Order for indefinite detention of terror suspects. President Obama is expected to sign it early next year. [t]he order establishes indefinite detention as a long-term Obama administration policy and makes clear that the White House alone will manage a review process for those it chooses to hold without charge or trial. If signed by President Obama, the new order will provide added review for detainees designated for long-term detention. The order, which is being drafted jointly by White House staff in the National Security council and the White House counsel, will offer detainees in this category a minimal review every six months and then a more lengthy annual review. Detainees will have access to an attorney, to some evidence against them and the ability to challenge their continued detention. Another disaster in the making: Via the ACLU, John McCain and Joe Lieberman have introduced the Enemy Belligerent Interrogation Interrogation, Detention and Prosecution Act of 2010. The Enemy Belligerent Interrogation, Detention and Prosecution Act of 2010, introduced by Senators John McCain (R-AZ) and Joseph Lieberman (I-CT), would also create an entirely new system of interrogation by requiring intelligence officials to be consulted about how to handle terrorism suspects after their capture. The bill was precipitated by misguided objections to the Obama administration’s correct decision to charge accused Christmas Day attacker Umar Farouk Abdulmutallab in the criminal court system. The legislation would have a “high value detainee” team, made up of members of different intelligence agencies, interrogate and determine whether alleged terrorist suspects are “unprivileged enemy belligerents.” If so, and if the suspect is then charged, the legislation would mandate the use of the discredited and unconstitutional military commissions. Who put Linsday Graham in charge of the Justice Department? Now Graham's insisting on a law authorizing indefinite military detention as a pre-requisite to closing Guantanamo. While Graham has long favored closing Guantanamo, he said Monday that his support for doing so is contingent on a new law to govern the detention of those the government wants to keep in custody outside the criminal justice system. He also said that, with such a statute in place, he could support Obama’s plan to convert a state prison in Illinois to a federal facility for former Guantanamo inmates. Marcy says Rahm Emanuel put him in charge. Big Tent Democrat wrote here about the Obama Administration's position on continued detention of detainees who may be acquitted. Justice Department official David Kris testified that the Due Process Clause of the Constitution should indeed apply to the commissions system. However, in other testimony, Defense Department official Jeh Johnson stated that the United States can continue to indefinitely hold detainees who have been acquitted of crimes. Is The White House Manufacturing Support for Indefinite Detention? "Civil liberties groups have encouraged the administration, that if a prolonged detention system were to be sought, to do it through executive order," the official said. Such an order could be rescinded and would not block later efforts to write legislation, but civil liberties groups generally oppose long-term detention, arguing that detainees should be prosecuted or released.